In the modern world the cell phones have become omnipresent devices. They are used by everyone and everywhere. The physically disabled persons also use the cell phones. These people require these devices more than ordinary people since they may need them in any emergency condition. The cell phones for such people are to be selected careful so that they can make use of it very efficiently. Some points regarding the selection of cell phones are given below. The first thing we must note regarding the cell phones is its size. The disabled person must be able to handle it easily. Nowadays the manufactures are producing the cell phones which are smaller on size and slimmer in thickness. But these phones will be difficult to handle for the disabled persons. Hence the cell phone should be large in size so that they can easily be held by the disabled persons. The other things are the keypad size and the screen size. The screen has to be large so that the persons with eyesight problems can easily view the text in the screen. The keypad should be large so that they can be easily handled by the disabled persons. In certain cases the disabled person cannot use the cell phones through their hands for such people the voice command is essential feature in a cell phone. The voice command feature in which using voice alone we can issue commands and operate the cell phones. The other features other than voice command are use of microphone, Bluetooth headsets etc. These equipment accessories help in handling the phone without touching it. Most important thing we must do for selecting a mobile phone for the disabled person is to ask the disabled person himself/herself to test the device. We must ask them to use all the features present in the cell phone. This allows them to check whether the device is easy for handling. After this we must ask their feedback regarding the cell phone. In case they have any difficulties towards the handling the cell phone we must find another model which will be much easier for handling. We must also assure from the sales person that such phones are specially designed for disabled persons. The cell applications features are also to be considered. The disabled person must be allowed to select the features they like. Some may like use of music players, cameras, and radio. These features also help in providing an entertainment for the person. The games also come under these features. The use of calendar and organizer are also to be considered. 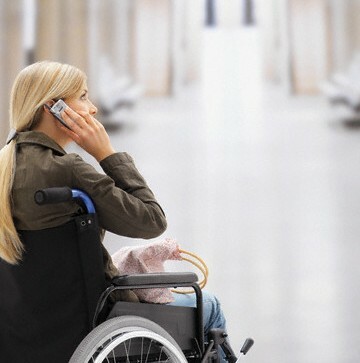 The cell phones since being compact there is possibility for the disabled person to lose them. Hence we must buy a cell phone which has certain protection plans like insurance. This feature comes with certain increase in price but it’s essential when we are selecting the cell phone for a disabled person. Though some model cell phones may appear to be easy to handle and may appear beautiful it’s not necessary that they can be handled by the disabled person. Hence we must select carefully by using these steps.